Only 16 teams in each bracket (A or B) ... first-come, first-served! 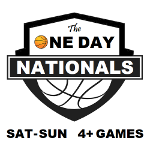 The ONE DAY SPRING NATIONALS youth basketball tournament will host over 100 travel, school and feeder basketball teams (A & B divisions - boys & girls 2nd-12th)! This is a 2-day tournament with pool & bracket play. Registration deadline is 10 days prior to the tournament. This basketball tournament sells out very quickly! ***Sunday's game times are impacted by Saturday's results (please make arrangements to be flexible)!